My mum, sisters and me on the far right. Yes, I had long brown curly hair! 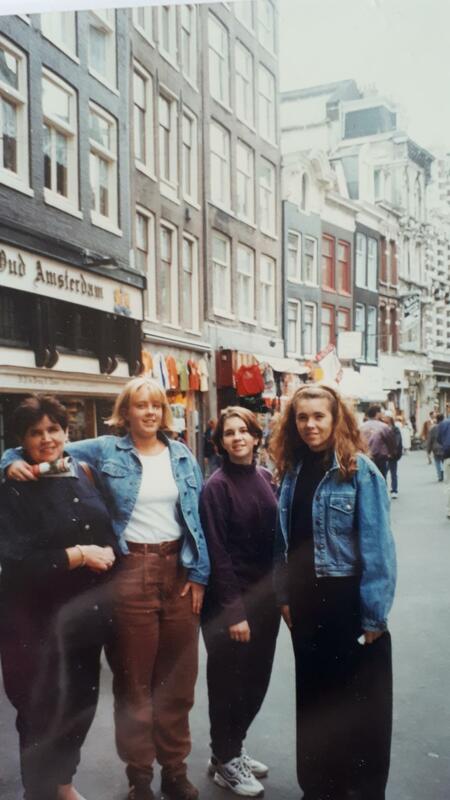 In 1999, my family and I spent the summer in Europe. We did the Griswold’s European Vacation where my Dad was the driver, and I was the navigator. My job was to read the map and to ensure we didn’t take a wrong turn. Back then, we didn’t have the luxury of Google Maps, and fortunately we only took one wrong turn in 4 weeks so Dad and I made a good team! One of the countries we travelled through was France. We arrived in a small town outside of Toulouse in the south of France near the Pyrenees mountains and we had to find accommodation. As no one in my family spoke a word of French, my dad asked me to make some phone calls to book our stay for one of the nights. We hadn’t booked this leg of the trip because we wanted a little bit of flexibility in case we wanted more time in a certain area or if the itinerary changed, so for this night we had to work it out on the way. It was lucky I dedicated 5 years studying this beautiful language whilst at high school so here was the chance to practice. So, to find accommodation, I had to go through travel guides. Tripadvisor or mobile internet didn’t exist. I was 18 at the time and it was better for my family to put trust into someone like myself who knew the local language. My French wasn’t perfect but it was enough to save time trying to find something suitable. I found a payphone and called a number of motels and eventually found one. We managed to secure a room for the night, and the rest of the trip went beautifully. You could imagine the process of finding accommodation would have taken a lot more time if I didn’t speak French. We could have ended up somewhere unsafe and we would have lost time spent on a great holiday. It’s the same thing as an influencer. When you’re building your business, you need to be able to position yourself as an expert in your field and your job is to be the translator. With so much information out there on the internet, anyone can easily Google what people do and know. But the difference is, experts build a tribe that sees them as the translator. As a translator, the benefits are that you save people time because they trust your expertise. You’ve consistently been able to share knowledge that’s valuable and remarkable to them and this has resulted in a positive experience in someone’s life. When I’m working with experts, influencers and personal branding businesses, I find they will often hold back sharing their knowledge. I find it’s because of the fear that no one would follow them. They also come up with self-limiting objections such as “I don’t have anyone on my database, no one’s going to read it, or they can get this information out there anyway”. The other concern that often arises is about adding to the sea of noise. By 2020 the content marketing industry is expected to be a $300billion dollar industry, up from a $165 billion dollar industry this year. The volume of information people are being exposed to is extraordinary, which means people lean into those they trust. In a recent interview with business growth expert Kerwin Rae, futurist Dr. Keith Suter said we’re seeing this shift from broadcasting information to narrowcasting. Broadcasting information is a piece of content that goes out to a really broad audience. Narrowcasting is the opposite – it aims messages at specific segments based on their values, preferences, beliefs and demographics. The idea of narrowcasting is that a mass audience does not exist and attention is paid to those who can save time and translate the noise to make it relevant to their specific audience. So a Sensemaker is like a translator. If you imagine that you’ve got this family or tribe who need your help. You’re in a foreign country and the itinerary keeps changing. Your job is to translate what is happening out there and into something that is meaningful and relevant to them. According to the Institute for the Future, sensemaking is one of the 10 key skills for the future of work. What is happening in this world that you can educate others about, regardless of if there is already information out there? Ignore what everybody else is saying. Stay focused on what it is that you know. Highlight to us the context, what your expertise means in our world and align it to the challenges and problems we are experiencing. From there share the solutions. If you do this, what will happen is you will tend to be far more focused on serving your customer and working in their best interest than being self-serving. Are you translating what you know to build the trust in your tribe? I would love to hear your thoughts and ideas. Jane Anderson is a communications expert, speaker and the author of 6 books including the upcoming “TRUST: The Level Above Influence.” With over 20 years experience helping people step into their personal power, she is obsessed about creating human connection to drive business growth in a world of disruption and automation. To inquire about her working with you or your organisation please contact us here. According to the US Department of Labour, by 2020 50% of the workforce will be self-employed. The ability to market and sell yourself has never been more important than now. The rise of experts in their field and access to industry leaders on social platforms has levelled the playing field. For those who wish to stay ahead of the game need to be positioned effectively to sustain their practice for the long haul. With over 20 years experience, Jane has helped over 20,000 people to build their personal brand. She has worked for personally branded businesses since she was 14 years old and has been featured on Sky Business, The Today Show, The Age, Sydney Morning Herald, BBC & Management Today. Jane holds one of the top 1% viewed LinkedIn profiles & is the host of the "Jane Anderson Show" Podcast. She was nominated for Telstra Business Women Awards in 2014, 2016 & 2018. She has been voted in the top 30 branding gurus globally and her blog is in the top 25 branding blogs in the world. Jane is also the creator of the Lead Generation Indicator, the world's first diagnostic for experts to identify marketing gaps in their practice. Her signature program "Expert to Influencer" is renowned amongst industry experts earning over $500k+ and mentors her clients to double their practice within 12 months. Telstra, International Rice Research Institute, Wesfarmers, Amadeus, Virgin Australia, IKEA, LEGO, Mercedes-Benz​, Australian Medical Association, Shell Energy & Workcover.